The samba school’s parade will center around the theme of education, setting good examples for young people, and also critiquing the small misdemeanors we all commit and the harm they can cause to others and to society. RIO DE JANEIRO, BRAZIL – On Sunday, March 3rd, samba school G.R.E.S. do Grande Rio will compete in the Grupo Especial with their parade scheduled to begin at 11:25 PM. The group will present their ‘samba enredo’ (thematic samba composition) along the theme of ‘Quem nunca…? Que atire a primeira pedra’ (Who has never…? Throw the first stone) which will focus on education while critiquing bad habits large and small. Following their tradition of inviting a celebrity to be their ‘rainha de bateria’ (queen of the drum), this year Grande Rio have invited back actress Juliana Paes, who also represented the school in 2018, photo courtesy of Gabriel Nascimento/Riotur. This year, the school are welcoming plenty of new faces, with the arrival of a new singer, Evandro Mallandro, a new ‘Primeira Porta Bandeira’ (Flag Bearer) Taciana Couto, and a new ‘Diretor de Bateria’ (Drum Director) Mestre Fafá. However, 2019 will also mark the return of the ‘Carnavalescos’ (Carnival Designers) Renato and Márcia Lage, plus a second appearance of O Globo actress Juliana Paes as their ‘rainha de bateria’ (queen of the drums) after her debut in 2018. Grande Rio will be participating once again in the Grupo Especial for the 27th consecutive year, following a controversial decision last year by ‘LIESA – Liga Independente das Escolas de Samba do Rio de Janeiro’ (Independent League of Samba Schools of Rio de Janeiro) Carnival’s governing body, not to relegate the school after they finished second-bottom of the group. Grande Rio have been a staple of the most prestigious samba school league since 1992, when they won first place in the Série A (Access Group) at the 1991 Carnival. Although Grande Rio are one of the newest samba schools, having only been founded in 1988, they have been members of the Grupo Especial for 24 years, finishing in second place three times, in 2006, 2007 and 2010. However, they are yet to be crowned Carnival champions. The school originally grew out of a Carnival ‘bloco’ (street party) which took place in Prainha, in Duque de Caxias, a city located in ‘Baixada Fluminense’ (a region of the state of Rio de Janeiro that surrounds the capital). It still has its headquarters on the Almirante Barroso street in Duque de Caxias. Last year, the school’s homage to Brazilian entertainer Chacrinha finished twelfth in the competition, a place that would usually have earned them relegation; however, they were reinstated in Grupo Especial after a controversial decision made by ‘LIESA – Liga Independente das Escolas de Samba do Rio de Janeiro’ (Independent League of Samba Schools of Rio de Janeiro) Carnival’s governing body, photo courtesy of Gabriel Monteiro/Riotur. Grande Rio is famous for often employing a celebrity to be their ‘rainha de bateria’ while also investing heavily in its parades. 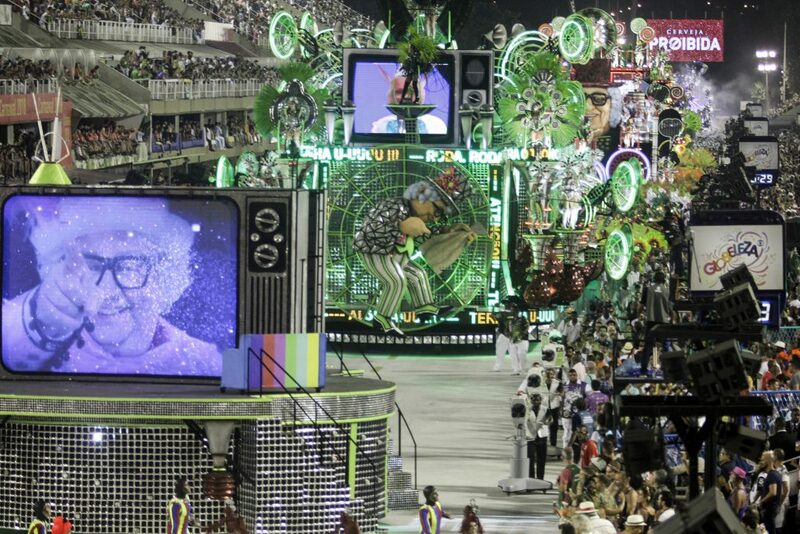 In recent years, they have conducted parades around the themes of the Amazon, their home city of Duque de Caxias, singer Ivete Sangalo, and last year’s parade in honor of Brazilian entertainer Chacrinha. The school narrowly avoided relegation to Série A last year when they and thirteenth-placed Império were controversially reinstated to Grupo Especial after much political maneuvering. With their theme of ‘Whoever casts the first stone,’ the school intend to address and make light of last year’s controversy. The school’s ‘Diretor de Carnaval’ (Carnival Director) Thiago Monteiro, who is part of the new wave of talent coming to the fore at Grande Rio, spoke to Carnavalesco about what people can expect from the school this year.